Our Business Is Your “Business”! First off, thank you for visiting our website. We pump, inspect, and service all types of septic tank systems. We service Vancouver, Battle Ground, Camas, Washougal, La Center, Ridgefield, Yacolt, Amboy, and surrounding areas within Clark, Skamania, and Cowlitz counties. 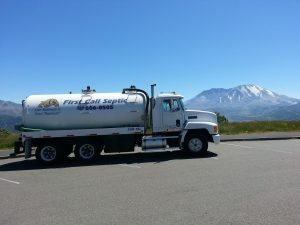 Specializing in septic pumping, septic inspections, septic cleaning, and onsite sewage treatment, our goal is to offer our customers quality septic services at competitive prices with a touch of humor. We strive to educate ourselves and our customers with the most up-to-date tools and equipment to best serve you. One of our goals is to educate customers on septic systems. How they work, the theories behind them, what to not put in them, and what to put in them. There are many varieties of systems out there ranging from standard (Gravity Systems) to complicated (Sand filters, and timed dosing). Our goal is to be up-to-date with all systems, maintaining systems with our onsite maintenance, and sending out our pump truck when required. Your system is designed to run roughly 85 years but because of neglect the average for life of a septic system has been reduced to 30 years. It is because of this that we strive to provide the highest quality of care for your septic system. We respond to all alarm calls within 24 hours. We drop our schedule of regular onsite maintenance for those who are experiencing a true emergency and we ask all of our customers to understand and be considerate in these situations. Sometimes you may have a question if a soggy spot in your septic system is anything to be concerned about, it all depends. If it is black and smelly, then it is a concern. The black is not sewage, rather it is a bacteria that forms when untreated sewage is being released. This issue requires attention and can usually be fixed fairly easy and painlessly. Remember, a lot of a septic system is made of PVC pipe and that is usually an inexpensive repair if attended to in a timely manner. We also accept most forms of payment; Visa, Mastercard, Discover Card, and American Express (so build your airline miles or cash back rewards) And yes, we do accept cash. Presently our web site is still under construction. We are making an effort to present you with our entire spectrum of offers as soon as possible. At this point we can provide you with information regarding septic services. The emphasis of our site is educating our customers so please check in again soon. Don't have contractors or anyone wash their paint brushes down the drain during a remodel. We accept most forms of payment. Visa, Mastercard, Discover Card, and American Express. So build your airline miles or cash back rewards. And yes, we do accept cash.